Spider Man Donuts just made me the bestest mom in the whole world (according to my Spider Man fan son!) 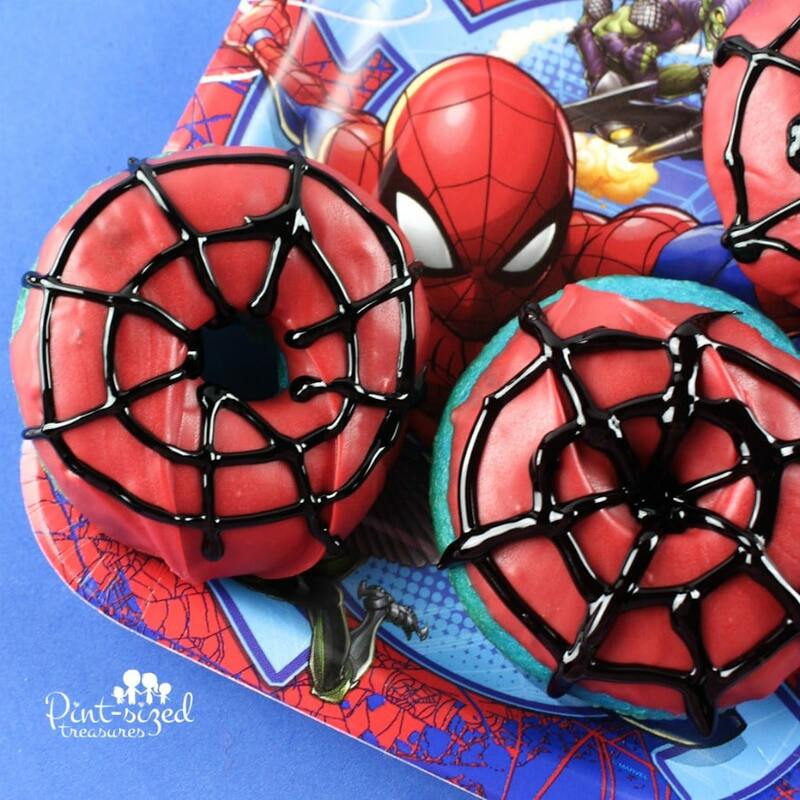 These super easy Spider Man Donuts are made from an easy cake mix! Why? Because busy moms like you need a break! Be sure to check out my bakery-style cake mix secrets in this post to make sure your doughnuts come out perfectly moist and dense! I know its kind of nerdy, but I connect with my sons on the level of superheroes. I know they love them so on sick days we cuddle up and watch one or two of the classic, older Spider Man cartoons. We’re a little bit more picky about the most recent Spider Man episodes, but we still try to watch our favorite super hero save the day! Don’t you love surprising your kids with an easy treat that’s on a “supermom” level? Though these look so creative and adorable, they’re truly a cinch to make! The blue cake mix creates the perfect Spider Man Blue! And trust me, getting a cake to turn blue without a cake mix is quite the adventure. I won’t mention how long it took me to get the perfect shade of blue without a cake mix! Sigh. Now red and black food coloring is the worst tasting food coloring on the planet. Can I get an “Amen?” You can shout for joy that this recipe doesn’t use any liquid food coloring or paste! You get these bright colors pictured here from tastier choices — candy melts and gels! 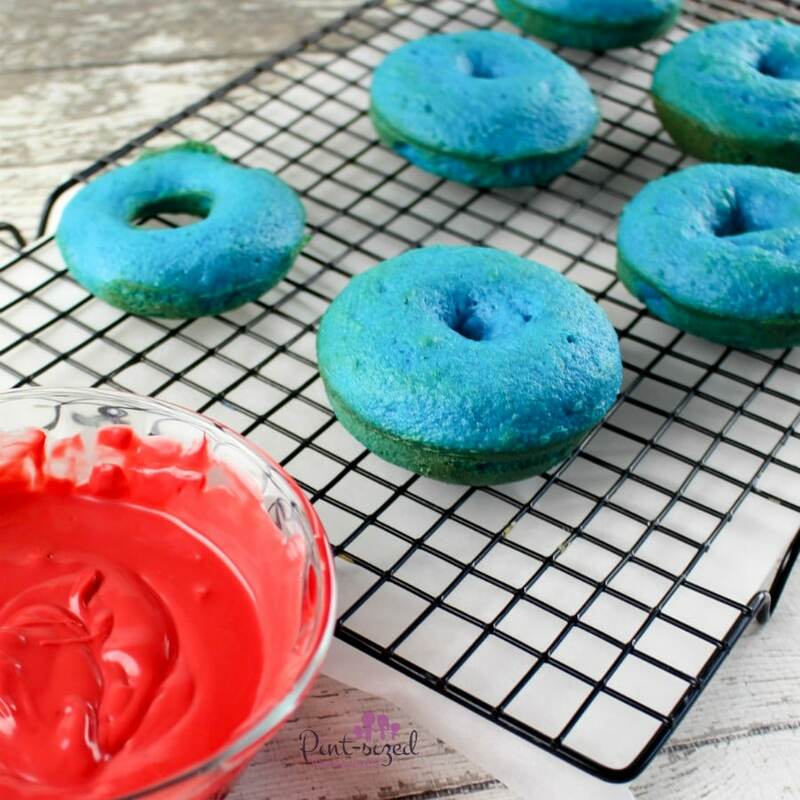 These donuts are perfect for any weekend treat, a Friday family fun night or even a big birthday bash! And I may or may not use special treats like these as bribes for my kids! Shhh! You didn’t hear it from me! These can also be fun rewards for successful potty days, successful naps or just “You’re the best kid in the world” day! 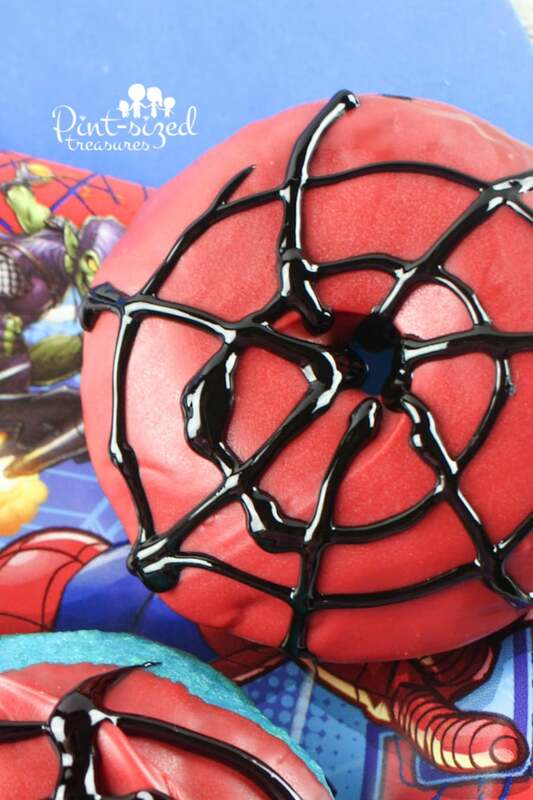 And please make sure you use the right donut pans for these super-cute Spider Man donuts! I want your exciting baking adventure to be fun, not stressful! Go ahead and grab one now and you’ll have the perfect baking pan for all your future donut needs! And red candy melts? They’re kind of a “must.” As a busy mom of kids I’m always cutting corners when it comes to recipes — but don’t skip the candy melts! They create the perfect red without all the nasty red food coloring flavor. You can snag those candy melts here and have them shipped to your front door in two days. Easy-peasy,right?! Go pre-heat your oven and be prepared for some BIG smiles when you serve these super simple, super-cute, easy Spider Man donuts! Have fun! 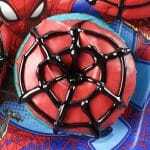 *Affiliate links have been added to help you find the perfect material to create your Spider Man Donuts! Super simple Spider Man donuts that are baked from a cake mix and topped with colors that actually taste good! Bright blues, reds and deep dark black create the perfect, super-fun Spider Man donuts that all Spider Man fans will love! Allow to cool five minutes before removing donut from pan. Melt red candy melts in microwave or with this Wilton Melting Pot. Dip the top of each donut into the red candy melts. Let harden for 5 minutes. You can also put into the fridge for it to harden.